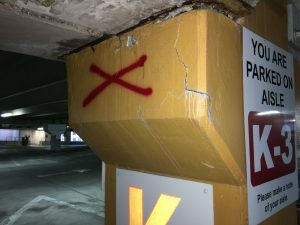 As a rule of thumb, a concrete crack less than .013” in the field of your parking structure (not at the connections) are common and are nothing to worry about. 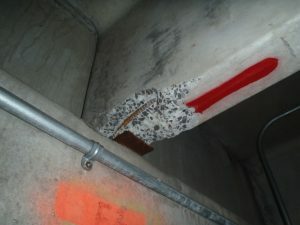 This is provided that they do not leak water, are not adjacent to a precast connection, and the cracked member is not visibly deflecting. Leaking cracks need to be sealed. 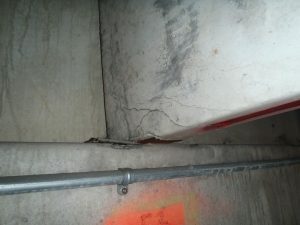 Cracks at precast connections need to be monitored as they will likely worsen, requiring a repair. Most parking structures are constructed of reinforced concrete. 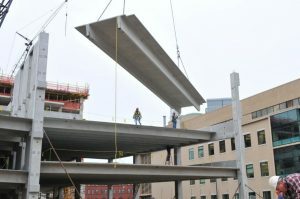 This may be in the form of precast, prestressed concrete members fabricated in a plant and erected on site, or Cast-In-Place concrete placed into formwork on site and reinforced with mild steel reinforcement, post tension steel tendons, or a combination of the two. See Figures 1 & 2. While concrete (a mixture of cement, aggregate, and water) is strong in compression, it’s relatively weak in tension. Thus, steel is added to the mixture to provide tensile strength. 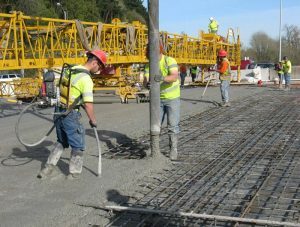 As the concrete mixture cures, the cement and water form a chemical bond through a process called hydration. 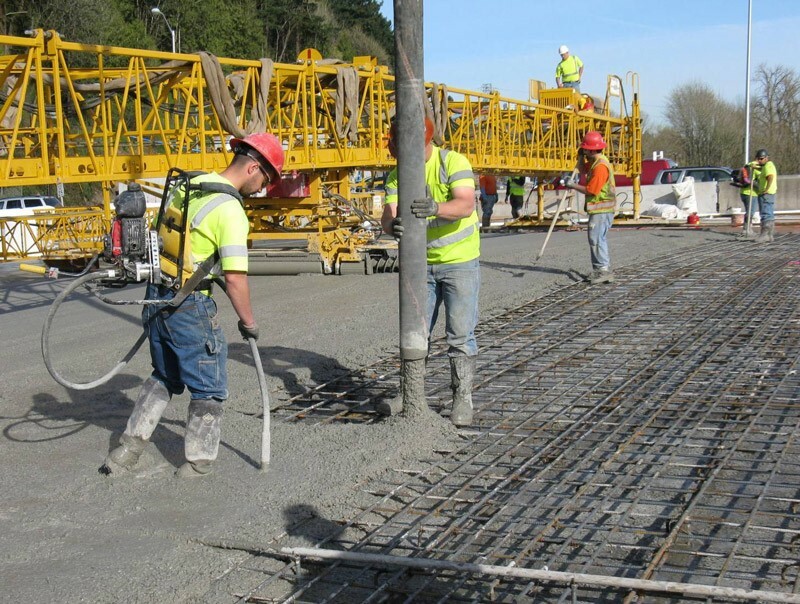 The resulting paste surrounds and adheres to the aggregate and reinforcing steel to form reinforced concrete. The volume of the concrete is reduced as water evaporates from the mixture and is absorbed during the hydration process. This reduction in volume causes cracks in the concrete. Cracks less than .013” in the field of your structure still allow for the necessary shear transfer through what is referred to as aggregate interlock. Therefore, as a rule of thumb, not only are cracks of this magnitude acceptable, they are to be expected. See Figure 3. 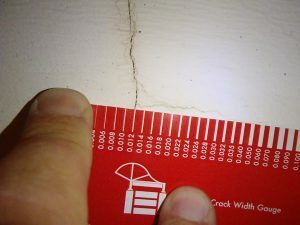 However, if the cracks are wider than .013” within the field of your structure and/or there are members are deflecting noticeably, you should contact a structural engineer immediately to see if temporary shoring and repair is required. If the cracks are leaking water, these too should be addressed quickly to minimize corrosion damage to the reinforcement. Similarly, cracks at the supports of a precast structure need to be monitored since they will progressively get worse. Figures 4 & 5 show the progress of support cracking over a 9-month period. This is a very common occurrence that should be repaired in a timely manner. An experienced parking structure restoration engineer can provide details for the restoration contractor to follow. You can also check out our blog post on your parking structure’s life expectancy here. 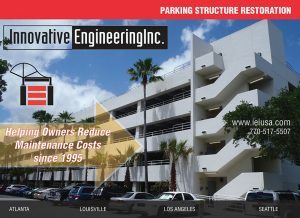 The engineers at IEI specialize in parking structure restoration. They will be glad to walk your facility and let you know of any conditions that require immediate attention and what maintenance activities you can perform now to extend the life of your facility. 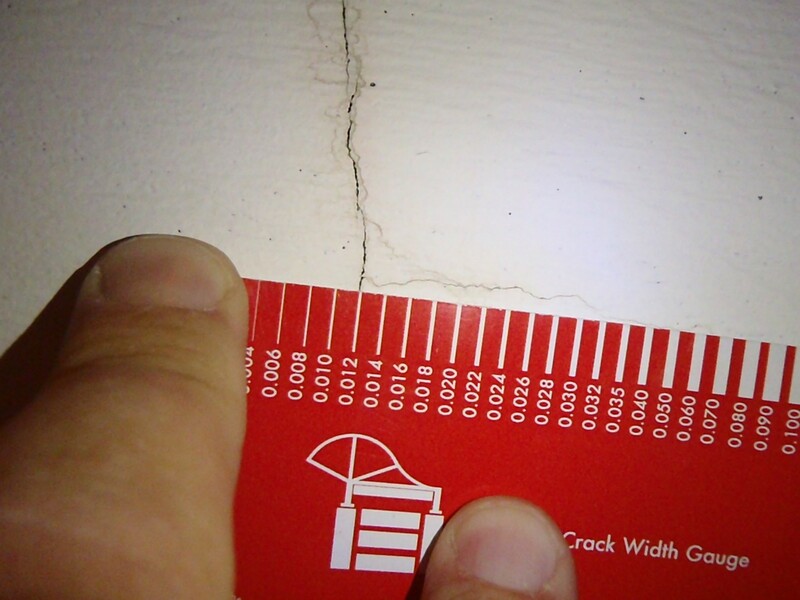 Since the back of IEI business cards contain a crack gauge, one can easily evaluate cracks within your structure. Give them a call today. Trusted Resource: IEI’s expertise is trusted by owners and property managers of all sizes. This includes some of the nation’s largest property portfolios. In addition to answering the requests for advice, consulting, and peer reviews, IEI is sought after for their expertise in the form of educational speaking events for national organizations, as well as articles in major national publications. The Right Level of Expertise: The IEI professionals performing your work are graduate and professional registered engineers. They possess the necessary engineering fundamentals required to understand the many elements that can affect the performance of your facility. Sounding: For evaluating solid surfaces, IEI utilizes a state-of-the-art sounding tool that can not only be used on horizontal surfaces, but on vertical and overhead surface as well. Sounding identifies voids, delamination, and future spalls. Thoroughness: IEI is often complimented by its existing customers for being thorough. IEI’s state-of-the-art techniques provide a more thorough Condition Assessment. 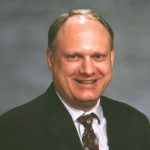 The time to know the true extent of any deficiencies is now, not after the restoration contractor has started work which leads to change orders and damaged reputations.